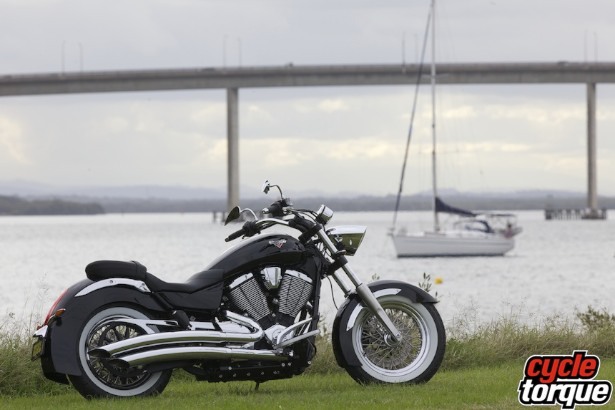 HEAVILY valanced guards, 16-inch wheels, super-low seat, footboards… the Victory Boardwalk was really ticking the boxes I love as I looked it over. With Victory’s 106ci fuel-injected motor and stunning graphics and paint, I was pretty sure I was going to love the Boardwalk before I even rode it. And love it I do. Climbing onboard I found what felt like the widest set of handlebars on any Victory. The low seat height and very wide ‘bars makes it an absolute snack to handle around inner-city traffic and provides a really comfortable reach when you’re out on the open highway and byways. Ground clearance comes in at 120mm, which isn’t too bad for a cruiser. And let’s face it, you know you’re going to scrape around those roundabouts… riding sensibly and not scraping, is, well, boring. The big open freeways are the only places you are going to be able to use that sixth-gear overdrive. Even fifth gear is enough on most highways. That big V-twin just lopes along and hardly feels like it’s working at all on those wide open roads, so at least you’re not going to chew through the juice at a stupid rate. 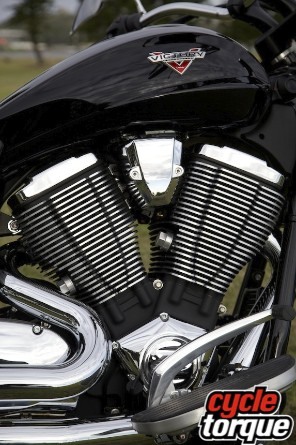 Victory’s engines haven’t changed a huge amount since they switched over to the 106ci inch for all the models. Single-overhead camshaft with four valves per cylinder with self-adjusting cam chains and hydraulic lifters and a big 101mm x 108mm bore and stroke. And all of it fed by EFI with dual 45mm throttle bodies. This air/oil cooled behemoth pumps it all out to the back wheel via a carbon-fibre reinforced belt drive. Not a huge amount of complication in there but boy does it work well. There were a few things that particularly caught my eye on the new Boardwalk. I’ve mentioned the heavily valanced fenders, but not how the wheels are laced and fitted with white wall tyres. Here are strong styling cues from the old school. And then there’s the Victory name itself – is that a new logo on the tank? Yes, this is a very interesting model indeed. And despite this hint of old school there are some very modern styling touches here too, apart from the new logo. Those pencil thin blinker stalks look cool and the vertical strip LED tail light embedded into the rear fender is also cool. Other things come down to personal choice. For instance the rider gets footboards but no heel-toe gearshift. Not that I dislike heel-toe shifts, it’s just on this particular model I felt it was cleaner and smoother with a standard gearshift lever. Again, it’s just personal choice. 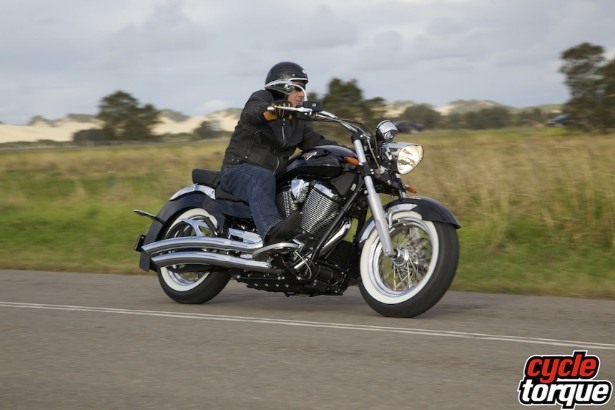 I have ridden various other Victory models including the Vegas, Jackpot and Hammer (that was an interesting one) over the last few years and as an unabashedly cruiser person I love the low-down grunt of Victory’s 50-degree Vee-twin. I thought it an interesting, and sensible, move a few years ago to drop the 100ci inch powerplant and just stick with the Freedom 106ci inch configuration. The 17.8 litre fuel tank will get you plenty of kilometres between fuel stops on those long trips where you can take advantage of the overdrive. Brakes on the Boardwalk work well with a 300mm floating rotor with four-piston caliper up front and a 300mm floating rotor with two-piston caliper on the rear. The lack of ABS on the Boardwalk almost came as a surprise – it’s becoming standard on more big bikes, but I can’t say I missed it. Our time on the Boardwalk covered inner city, ’burbs and a few blats further afield. Even though the Boardwalk weighs in at 307kg (dry) this doesn’t disadvantage this model in the city. When you consider the seat height is only 658mm – man, there are LAMS bikes out there with taller seat heights! So my vertically challenged frame felt right at home on the Boardwalk, especially with that beautifully sculpted seat – very comfortable, especially on the upper thighs. Suspension duties are handled by conventional telescopic forks up front with 130mm of travel while the rear is a single mono-tube gas set-up with 75mm of travel and a preload adjustable spring. The travel’s a bit short in the rear, so its performance on poor roads was pretty ordinary, but it’s fine on any reasonable surface. There were a couple of aftermarket additions to the bike we tested. 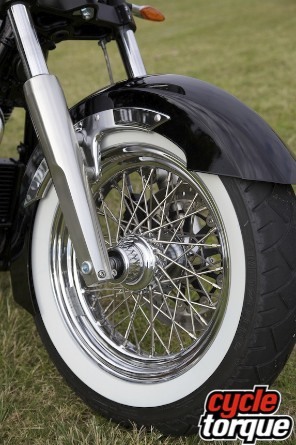 The teardrop shaped mirrors are the Ness Rad Chrome and look beautiful. And yes, there is actually really good vision unlike some aftermarket mirrors that look cool but are virtually useless. The pipes are a Crossbow free-flow system. They look really good and sound great, without being obscenely loud. I confess that I do like obscenely loud pipes but the Crossbows have plenty of aural cred. The Derby cover on the right-hand side of the crankcases is a scalloped Ness item for a nice subtle touch. Victory dealers have got this machine very competitively priced at $21,995 (not including the aftermarket items on our test machine). At that price that’s a huge amount of motorcycle for your money. Of course it comes with a two-year, unlimited km warranty.